which we understand all about and you don’t, as yet. In Module 2, Ceremonial Public Speaking, Organisation and Choreography, we give the student a grounding and awareness of the essential practical skills needed by a successful celebrant. And there are certain principles of organisation and structure which are common to the creation and co-creation of any personal ceremony. Of all the necessary celebrant skills, and there are many, the one most obvious to the audience is the ability to speak clearly and pleasingly. Mostly, this includes the technical skill of using a microphone and PA system so it not only enhances volume but also clarity. The PA system has to be of good quality and used to its best effect. The celebrant must develop a good “feel” for the ceremonial pace of speaking. At the rehearsal, the celebrant has the task of diplomatically coaching the other participants in the ceremony to the extent they too are” heard, understood and appreciated”. These are just some of the ‘up-front’ skill of the celebrant, which is difficult to teach by Distance Education, however we do it! has clear diction and knows exercises, including breathing exercises, for sustaining clarity and audibility. to read poetry and prose with competence, due understanding, inflexion, and emphasis. A celebrant should have the interpretative skills, personal aptitudes, technical skills, and voice management ability to read and speak competently i.e. the elements of voice and speech which effectively transmit thought, mood and feeling. to set up a portable PA system for the celebrant and readers, then use the system competently with appropriate microphone techniques. 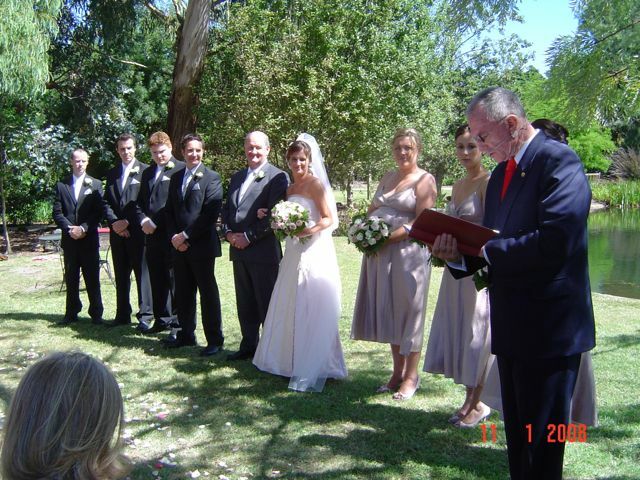 The celebrant needs to have a grasp of the details necessary in the preparation for and the performance of a good ceremony, as well as the pitfalls and hazards. The celebrant needs to rehearse and orchestrate the movement and the choreography of the ceremony so it flows in a manner which enhances the occasion for all present. To have impact the ceremony must have “flow” yet the discrete pericopes of the ceremony must be cleanly delineated e.g. the monitum must be separate from a reading, Vows must be separate from the Giving of Rings and much more. The celebrant must know where to stand or sit, and must ensure that the wedding party knows were to move and when they must do so in unison etc. And much more! 2.canalyse the unique nature of ceremonial audiences. Literature Review – of supplied texts. The aim of this module is to communicate basic ideas and raise awareness of the student’s capabilities. Detailed assessment by a qualified voice coach should make the student aware of their strengths and weaknesses in the vital areas of speech, voice and presentation. It may be, by practising certain exercises a student with poor voice quality may come up to a competent level. If private coaching is required to achieve this competence, it must be pursued at the student’s expense. 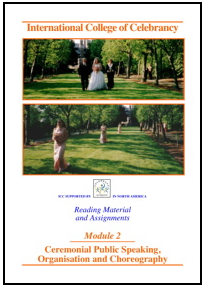 All manuals and DVDs are provided, including “Ceremonies and Celebrations” if not previously provided, and will be made available immediately, once the College receives full payment for the module. If the module manuals, books, DVDs and other items are downloaded from our website a discount will apply. Otherwise the items will be sent by post, airmail where necessary. Transferring any materiel belonging to the College to a third party without prior permission is unethical and strictly forbidden.